This is a copy of the Museletter #149 from Richard Heinberg published in August of 2004. He gave me permission to reproduce it here. For decades the US dollar has served as the world's default currency. The phrase "sound as a dollar" has expressed the faith and confidence of generations, not only of Americans, but people worldwide. That situation is coming to end, and the consequences will be far-reaching. A Brief History of Money In order to understand why this sea change is about to occur, and what is at stake, it is necessary to begin by examining in the briefest terms the history of money, banking, and the dollar. Hunter-gatherer societies typically enjoyed a gift economy in which trade and barter occurred only with people external to the tribe or band. Everyone within the band was treated as family: whatever was available was shared without expectation of reciprocal exchange. The story of the rise of social complexity is also the story of the gradual shriveling of the gift economy and the expansion of the scope of trade - a story that culminates in our situation today, in which the market mediates nearly all categories of transactions between and among humans, sometimes even within families. Even many relatively complex societies of the past (such as the ancient Egyptian and Inca civilizations) managed to do without money. However, this new tool, wherever it appeared, served to facilitate and accelerate trade. Its effects are predictable; French Historian Fernand Braudel, writing of Europe in the Middle Ages, described them as "steep variations in prices of essential foodstuffs; incomprehensible relationships in which man no longer recognized either himself, his customs, or his ancient values." The individual caught up in medieval Europe's monetization process found, again in Braudel's words, that "his work became a commodity, himself a 'thing.'" The kinds of money people have used are almost endless; however, in societies that have adopted the widespread use of money, coins made of precious metals long ago became favored over other options (including shells, beads, cattle, and, in China, paper) due to their relative durability, portability, and rarity. Since money serves several possible functions-a store of value, a measure of value, a medium of exchange, and a standard of deferred payment - in some cases individual societies have used two or more forms of money simultaneously. Monetary history took a decisive turn with the emergence of banking in Europe during the Middle Ages. Since traveling traders were frequently robbed of their coins or metal ingots, they took to depositing their metallic currency in the strongboxes of silversmiths and goldsmiths, and carried redeemable receipts instead. Gradually these receipts came to be regarded as being equivalent to the metal itself. This was the first paper money. Meanwhile, gold- and silversmiths discovered that it was possible to issue receipts for metal coins which they did not actually possess, a practice that would eventually give rise to fiat currencies and fractional reserve banking. Fiat currencies did not appear in the West in any significant quantity until the 19th century, when governments and national banks began issuing notes not backed by any precious metal coinage whatever. Fractional reserve banking emerged at about the same time as a system whereby banks were legally permitted to loan more money than they retained in deposits (regardless of whether those deposits were in the form of gold or fiat money). This process seems mysterious and perhaps even a tad unethical to most people when they initially learn of it. However, it has become the foundation of modern banking and currency systems. In effect, when a commercial bank makes a loan, it creates money from nothing; when the loan is repaid and is stricken from the books, that money effectively disappears. Since it has been loaned into existence, virtually all fiat currency in modern money economies is tied to debt, which requires the payment of interest. The regulation of the money supply therefore depends on someone's ability to set interest rates and thus encourage or discourage the seeking of more loans. Early Life of the US Dollar From this point on, we will focus our attention on a particular currency - the US dollar. During the Revolutionary War the provisional authorities issued paper money, which led to counterfeiting by the British and various other forms of fraud. The 1792 US Coinage Act provided for a national Mint where silver dollars were to be produced along with gold coins, beginning in 1794. The Act states: "The Dollar or Unit shall be of the value of a Spanish milled dollar as the same is now current, to wit, three hundred and seventy-one and one-quarter grains of silver." The Act also prescribed the death penalty for anyone debasing the national currency. The framers of the American Constitution were divided on the question of whether their new nation should have a national bank. Proponents (who were themselves bankers or future bankers) argued that a national bank would be necessary for the proper regulation of a national currency; opponents argued that such an institution would effectively give a tiny banking elite control of the nation's economy. The opponents won: Article I of the US Constitution gave Congress the power to coin money. However, the proponents of a national bank, led by Alexander Hamilton, did not give up. At the time, in addition to the fledgling national currency, other currencies were issued by local banks. The nation needed a single money and a way of financing the government. All of the government's financial needs, said the Hamiltonians, should be underwritten by funds borrowed from the national bank, and repaid by the government with funds raised by taxation from the people. Thomas Jefferson led the opposition. Twice in the 19th century a national bank was established (in 1791 and 1817), and twice abolished (the first in 1811, the second in 1832, both times on charges that the bank was corrupt and unconstitutional). Further attempts were made to establish a national bank until the early years of the 20th century, but were rejected on constitutional grounds. The nation's money, controlled by the government, was sometimes a fiat paper currency, and sometimes gold- or silver-backed. Periods of inflation or deflation led to depressions. Private banks continued to issue their own bank notes as currency until the end of the Civil War, during which Lincoln floated millions of dollars in fiat "greenbacks" in order to finance the army. In 1878, Congress began to redeem greenbacks into gold, which effectively put the US back on the gold standard until 1933. In general, the Republicans were married to gold, while Populists, Democrats, and the "Greenback Party" promoted silver and/or the printing of lots of paper money. They argued that gold had become concentrated in the hands of the bankers; if money were to get into the hands of "real people," the government would have to issue more fiat or silver-backed paper notes. The monetary question split the nation for decades. Clearly, gold as money acts as a barrier to the expansion of credit money. This can be both good and bad: it prevents hyperinflation, but it can also put a brake on economic activity, leading in the worst instances to deflation and depression. In 1896, the conflict came to a head as Populist William Jennings Bryan ran against pro-gold Republican William McKinley. Though McKinley won, gold's time had passed. Following the depression of 1907, Congress passed the Owen-Glass Federal Reserve Act of 1913, which established the national banking cartel that controls the nation's currency to this day. The Federal Reserve (known colloquially as the "Fed") is a peculiar hybrid government-private institution whose chairman is appointed by the US president but whose stock is entirely owned by member banks. In effect, the Fed is a private corporation owned by the interests that it nominally regulates on behalf of the people. After the Fed's establishment the government quickly recalled its Treasury Notes and the Fed began issuing Federal Reserve notes with a promise to redeem them for gold upon demand. Congress also handed the Fed control of the nation's gold. The Fed then began loaning back the gold, at interest. The Fed's tools for controlling the economy are few but powerful. It sets the rules for member banks for fractional reserve banking (money creation), and sets the discount rate (the rate of interest charged to member banks for the privilege of creating money). When the federal government wishes to take out a loan to pay for a new bomber or highway, it effectively borrows the money from the Fed (though the debt usually then gets spread around to various domestic and foreign investors), which thus controls not only the nation's monetary system but government credit as well. The benefits issuing from the flow of insider information that results from that control are unknown but surely considerable. The Fed's deliberations occur in secret and the institution has never been audited. Even after the Fed's creation, several kinds of currency existed from time to time during the early 20th century, including United States Notes, Gold Certificates, and Silver Certificates. But, from about 1965 to the present, virtually all US currency has consisted of Federal Reserve Notes - i.e. money created not by the government (which merely prints the paper notes themselves, which it sells to the Fed for the cost of printing), but by Federal Reserve and its member banks. On March 9, 1933, at the deepest point of the Great Depression, Franklin Roosevelt issued Executive Orders 6073, 6102, 6111, and 6260,effectively declaring the US bankrupt. On April 5, 1933, Roosevelt declared a National Emergency that made it unlawful for any citizen of the United States to own gold, and ordered all gold coins, gold bullion, and gold certificates turned in to Federal Reserve banks by May 1 under the threat of imprisonment and fines. On June 5, 1933, Congress enacted a joint resolution outlawing all gold clauses in contracts. Henceforth, for the next forty years, a dual monetary system would prevail which denied gold redeemability to Americans, while retaining it for foreigners. The Dollar Triumphant This brings us to the story of the dollar's rise to international prominence. Prior to World War II the British pound sterling came close to being a globally accepted standard currency, largely as a result of the fact that it was issued by an Empire upon which the sun never set. However, neither the Empire nor the British economy survived the War intact. The US economy, meanwhile, though having been hammered by the Depression, emerged from the Second World War more robust than ever. A post-War economic and geopolitical regime gradually emerged during the years 1944 to 1948. Postwar geopolitics would consist of a long political Cold War (which was also an economic war between the US and the USSR, itself a major oil producer and goods exporter within its sphere); meanwhile, the non-Soviet-dominated global economy would be shaped in agreements settled upon at international meetings in held Bretton Woods, New Hampshire. The Bretton Woods meetings of 1944 led to the establishment of the International Bank of Reconstruction and Development (which later became the World Bank) and the International Monetary Fund. The chief feature of the Bretton Woods system consisted of the obligation for each country to maintain the exchange rate of its currency within a fixed range - plus or minus one percent - in terms of gold. This well suited the United States, which at the time happened to have the largest gold reserves of any nation. The arrangement worked reasonably for all concerned, as long as America remained the world's foremost energy producer and goods exporter - which permitted it in turn to maintain its gold reserves. The US extended dollar credits by way of the Marshall Plan to finance the rebuilding of post-war Europe, while American oil companies (and the Texas Railroad Commission) maintained stable prices for petroleum globally. During this period US foreign and domestic policy were characterized by liberalism: at home, economic inequality was at the lowest point in modern American history; while abroad the United States maintained minimal trade barriers between itself and Western Europe, Japan, and South Korea. It could easily afford to absorb exports from these nations in return for their commitment of support for the duration of the Cold War. The US exercised leadership by consensus - again, because it could easily afford to do so. This consensus evolved through both GATT trade negotiations and geostrategic Bilderberg meetings, in which the main Western powers conspired to effectively control the economies and political destinies of most of the rest of the world's nations. However, this first relatively benign phase of what Henry Luce called the "American Century" came to an end as a result of the confluence of three factors: the decline of US oil production, spiraling national debt brought on by the Vietnam War, and increasing European and Japanese economic strength. All during the 1960s, France's de Gaulle began to take . . . dollar export earnings and demand gold from the U.S. Federal Reserve, legal under Bretton Woods at that time. By November 1967 the drain of gold from U.S. and Bank of England vaults had become critical. The weak link in the Bretton Woods Gold Exchange arrangement was Britain, the "sick man of Europe." The link broke as Sterling was devalued in 1967.That merely accelerated the pressure on the U.S. dollar, as French and other central banks increased their call for U.S. gold in exchange for their dollar reserves. They calculated that, with the soaring war deficits from Vietnam, it was only a matter of months before the United States itself would be forced to devalue against gold, so better to get their gold out at a high price. The break with gold opened the door to an entirely new phase of the American Century. In this new phase, control over monetary policy was, in effect, privatized, with large international banks such as Citibank, Chase Manhattan or Barclays Bank assuming the role that central banks had in a gold system, but entirely without gold. "Market forces" now could determine the dollar. And they did with a vengeance. In 1973, with the dollar now floating freely, the Arab nations of OPEC embargoed oil exports to the US in retaliation for American support for Israel in the Ramadan/Yom Kippur War. By this time it was clear that US oil production had peaked and was in permanent decline, and that America would become ever more dependent upon petroleum imports. As oil prices soared 400%, the US economy took a nose-dive. The US and Saudi Arabia had formed a cooperative partnership in 1945, following meetings between FDR and King Ibn Saud. US oil companies (Exxon, Mobil, Chevron, and Texaco) were already controlling Saudi discovery and production through a partnership with the Kingdom, the Saudi Arabian Oil Company (Aramco). In 1973, the Saudi Government increased its partner's share in the company to 25%, and then 60% the next year. In 1980, the Saudi government retroactively gained full ownership of Aramco with financial effect as of 1976. At about the same time this was happening (1975), the Saudis agreed to export their oil for US dollars exclusively. Soon OPEC as a whole adopted the rule. Now, as a result, the dollar was backed not by gold but, in effect, by oil. Had the US permitted the Saudis to nationalize their oil industry in return for this extraordinary favor? Because the Saudi royal family and the oil companies are all notoriously tight-lipped, we may never know. In any case, the oil shock created enormously increased demand for the floating dollar. Oil importing countries, including Germany and Japan, were faced with the problem of how to earn or borrow dollars with which to pay their ballooning fuel bills. Meanwhile, OPEC oil countries were inundated with oil dollars. Many of these oil dollars ended up in accounts in London and New York banks, where a new process - which Henry Kissinger dubbed "recycling petrodollars" - was instituted. Also during the 1970s and '80s, the Saudis began using their petrodollar surpluses to buy huge inventories of unusable weaponry from US arms manufacturers. This was a hidden subsidy to the US economy, and especially to the so-called Defense Department. As Engdahl points out, the petrodollar era was characterized by the US attempt to slow its geopolitical decline (arising from imperial over-extension abroad and resource depletion at home) by making the dollar a hegemonic currency The IMF "Washington Consensus" was developed to enforce draconian debt collection on Third World countries, to force them to repay dollar debts, prevent any economic independence from the nations of the South, and keep the U.S. banks and the dollar afloat. The Trilateral Commission was created by David Rockefeller and others in 1973 in order to take account of the recent emergence of Japan as an industrial giant and try to bring Japan into the system. Japan, as a major industrial nation, was a major importer of oil. Japanese trade surpluses from export of cars and other goods were used to buy oil in dollars. The remaining surplus was invested in U.S. Treasury bonds to earn interest. The G-7 was founded to keep Japan and Western Europe inside the U.S. dollar system. From time to time into the 1980s various voices in Japan would call for three currencies - dollar, German mark and yen - to share the world reserve role. It never happened. The dollar remained dominant. Simultaneously, during the 1980s the US effectively bankrupted the Soviet Union by forcing the Soviets to pump their oil reserves at the maximum rate in order to pay for the escalating arms race with America and the US-fomented Afghan war, while reducing oil income to the Soviets by asking the Saudis to keep world oil prices low. As foreseen by the CIA, Soviet oil production peaked; and, as it declined, the nation's economy imploded. The Cold War had been won. The petrodollar era had worked to the American financial elite's advantage, but at a horrendous cost to the people of the Third World and to those of the former Soviet Union as well. Living standards declined in all of these countries as IMF "structural adjustment" policies opened markets to the predatory process of globalization led by US-based multinationals seeking cheap labor and raw materials. The people of the US suffered also, as America's manufacturing base was "hollowed out" through outsourcing. While a quarter-century previously 60% of the world's export goods had carried a "Made in USA" label, now American companies were interested primarily in "branding" products made in China or Central America. Jobs for US workers were consequently down-sized. During the petrodollar era, American foreign economic policy and military policy continued to be dominated by the voices of the traditional liberal consensus, which required that the US acted in concert with its allies. But this was about to change. 1999-Present: Hegemonic Decline, Imperial Hubris As the Cold War ended, Europe was in the process of forging political and economic unity. Today the European Union and the euro - an entirely new pan-European currency - present a subtle but serious threat to continued American monetary hegemony. This challenge has developed slowly over the past 15 years, but its effects are cascading into view. In the US-British invasion and occupation of Iraq we see the dynamics of this new challenge at play, including the American response to it. The Washington neoconservatives have a term for this response: "democratic imperialism." As Jeremy Rifkin documents in his new book, European Dream: How Europe's Vision of the Future is Quietly Eclipsing the American Dream, Europe is ever less a collection of squabbling nations and ever more a cohesive economic superpower -one that exceeds the US in GDP, population, and productivity. Europe shares America's dependency on depleting foreign sources of oil and gas, and will likely be hit hard by the effects of global climate change. Thus, over the long term, Europe's prospects are dim-though no dimmer necessarily than those of any other region. However, in the short term Europeans will enjoy some advantages over their American counterparts, including much greater energy efficiency (Europeans use energy at one-half the per-capita rate as Americans) and much less debt, resulting partly from much smaller military budgets. Moreover, Europe sits next to Russia, which still has considerable quantities of exportable oil and gas and stockpiles of nuclear and conventional weapons. A Eurasian alliance between Russia, Germany, and France would be a geopolitical nightmare for Washington -and such an alliance is beginning quietly and tentatively to emerge. Europe is also geographically closer to the oil and gas reserves of the Middle East and Central Asia, which are increasingly accessible to it by pipeline (the US must rely on tankers). The development of this Eurasian challenge comes at a bad time for Washington, which is in no position to offer the kinds of trade concessions it did in earlier decades in order to maintain the G-7 consensus. America's only remaining strong suit is raw military power, and thus its only options are either to decline gracefully from its position as sole superpower, or use its military to enforce global dominance. Engdahl suggests that the neo-conservatives gained influence in Washington because a majority in the U.S. power establishment finds their views useful to advance a new aggressive U.S. role in the world. Rather than work out areas of agreement with European partners, Washington increasingly sees Euroland as the major strategic threat to American hegemony, especially "Old Europe" of Germany and France. Just as Britain in decline after 1870 resorted to increasingly desperate imperial wars in South Africa and elsewhere, so the United States is using its military might to try to advance what it no longer can by economic means. Here the dollar is the Achilles heel. To understand why the dollar is America's Achilles heel, a metaphor is useful. Imagine being able to write checks and then convince the people you give them to not to cash them. Perhaps they find the checks themselves comforting to hold onto; or maybe you have a friend who agrees to sell groceries or gasoline for your checks only, and then happily stockpiles and re-circulates them. In either case, you may be tempted to write checks for much more than you have in your bank account. As long as the checks themselves are regarded as valuable and not cashed, you get a free ride. But if people stop finding your checks comforting to hold onto, or if your friend starts selling groceries for other people's checks or for gold or silver, then the game is up. It will be revealed that your account is overdrawn and you will be in trouble. The metaphor is not perfect. In fact, every nation in the world is attempting to write checks beyond its means. But the US has managed to do by far a better job of it than any other nation. The checks we are not talking about are not just hoarded paper dollars (though there are billions of these stuffed in mattresses around the world) but dollar-denominated investments and securities, including T-bills, stocks, and mortgages. Currently the US is running a $700 billion per year trade deficit, this on top of trillions in government debt and trillions more in consumer debt. No other nation in the world comes remotely close to this level of bad-check writing, on either a total or a per-capita basis. If a run on the US dollar were to occur, then the only financial solution would be to create even more dollars (presumably through government borrowing), which of course wouldn't actually solve the problem and would in the long run make matters worse. The currency would become almost worthless, and in the process real wealth (land, factories, and natural resources) would be confiscated and turned over to creditors. What could cause this to happen? A decision by OPEC to openly sell oil for euros could be a trigger. Some oil is already quietly being sold for euros, and several countries including Iran and Saudi Arabia have floated the possibility of valuing oil against a basket of currencies (meaning, effectively, dollars and euros). The Arab OPEC states have also toyed with an idea that must be equally worrisome to Brussels and Washington: to sell oil for gold (the gold dinar). If and when this happens, the full wrath of America will descend upon the Arab Middle East - and that's why it hasn't happened yet. The other likely trigger would be a collapse of the US economy from within resulting from a bursting of the mortgage bubble. The recent US economic "recovery" arose almost entirely from low mortgage rates (set ultimately by the Fed), which allowed families to refinance their homes, cash out some of their equity, and use the money for immediate consumption. With oil prices soaring, the Fed will eventually have to raise interest rates steeply in order to contain inflation. But this may cause millions of homeowners to default on their currently low-interest adjustable-rate mortgages. In that event, property values would plummet, and with them would go the stock market and the economy as a whole. If the Fed's real owners are confident in the present Washington leadership, they will do everything in their power to delay the inevitable until after the election (and this is what they seem to be doing). If they think it is time for a regime change, we may see the great unraveling begin even before November. In either case, the response of US political leaders may be merely to seek foreign scapegoats. As Stan Goff writes in his recent essay, "Persian Peril" (www.fromthewilderness.com), it appears as if Iran is currently being set up as the next domino in the neocons' crusade for democracy in the Middle East. With Iranian and Russian cooperative energy agreements blooming, a US attack on Iran could be the trigger for another all-out conflict on the order of the World Wars of the 20th century. On the other hand, it is possible that the disastrous outcome of the Iraq invasion has sunk deep enough into the awareness of Washington elites that further similar adventures (however desperately sought by the neocons) will be headed off by cooler minds. There is no solution to any of this - in that there is nothing we can do to make the problems go away. Their origins go far back in time and are intertwined with the history of money itself, though money per se is not at the heart of the matter. Access to resources is, as ever, the ultimate determiner of human destiny, but money has become a tool universally used by humans to gain and hold access to resources, and as such it introduces its own set of possibilities and perils. While there is no solution, there must be responses, and some are better than others. Relocalization of economies (moving producers and consumers closer together) and local currencies are good places to start. If you wish to republish any of these essays or post them on a web site, please contact us for permission. What happened to the oil prices during 2009? What will happen in the future? The oil price reached a peak in July of 2008. As the financial markets collapsed and a severe recession established itself, the demand for oil decreased globally. This happened as a consequence of generalized diminished economic activity. As a result of this, the oil price decreased significantly reaching levels not seen in many years. Gasoline prices, natural gas and coal also decreased accordingly since they also are used to power economic activity. During 2009, the energy prices have increased steadily. News related to an economic recovery usually are associated with increases in oil prices. News related to the persistence of the recession such as the unemployment rate and the bank failures are associeted with decreases in oil prices. It is important to point out that the current oil price almost doubles the value at the start of the year, taking into account that the world economy has not fully recovered. a.- The relationship between its supply and demand. b.- Market speculators since the commodity can be traded easily. c.- The purchasing capacity of the dollar. The relationship between supply and demand seems to show a pattern of inability of supply to keep up with demand. This was clearly visible in the easily available charts of IEA and other entities. In the years leading to 2007, in the midst of global economic growth, the supply side of the equation was not able to keep up with demand increases, the consequence were price increases. Market speculators probably helped pushing the price up, specially after the first signs of financial collapse when the cash available from the fleeing the financial sector was used to appreciate the value of commodities. The purchasing capacity of the dollar has been diminishing progressively as more dollars need to be printed to cover the financial deficit. If we compare the value of oil with respect to gold, its increase has not been as steep. What we are probably going to see in the future is an oil price that will increase and decrease based on the overall economic activity since the supply side is under too much stress. High oil prices will slow down economic growth and limit recovery attempts. Speculation will remain a player, making the swings in the oil price steeper than expected from regular supply/demand curves. The value of the dollar will continue to decrease and, as a result of that the oil price will have a trend towards always higher. How high? This will probably depend on the inflation rates of the U.S.A in the maintenance of the dollar as the global reserve currency. This is an opinion post. What I have posted here reflects only the results of my understanding of issues about which I am not an specialist but an aficionado. Recession: the reduction of a country's gross domestic product (GDP) for at least two quarters. Depression (economic): any economic downturn where real GDP declines by more than 10 percent. Hyperinflation: an extreme rate of inflation in which the general price level of goods and services, usually measured by the Consumer Price Index (CPI), rises very rapidly. Stagflation: an economic situation in which inflation and economic stagnation occur simultaneously and remain unchecked for a period of time. Terrorism: the calculated use of violence (or the threat of violence) against civilians in order to attain political goals. Nobody knows how things started; however, many of us know what happened. Many theories float in the air. They blame the Spanish colonial rule of the 16th, 17th, 18th centuries, the Chilean invasion in the late 19th century, the Great Depression, the World Wars, the Cold War, the military governments, el Nino phenomenon, the Oil crises, the debt crisis, etc. Nobody knows the real answer. The truth is that in those 5 years Peruvians experienced all the words that were defined at the beginning of this post. In 1987, Peruvians had Alan Garcia as president. A young politician from an old party, elected president in 1985, and, probably, the best orator of modern times. He brought a social-democrat agenda and his populism filled up the Peruvians with hope. By mid 1987, the dream of getting rid of the epithets of “poor country” and “third world nation” was starting to become true. The country’s GDP had grown 12.1% in 1986 and it was growing at a similar rate during 1987. That year, the president decided to confront the economic elite because “they were not investing in the country”. This, together with ill-conceived financial decisions, worsened what was already in place: a high rate of inflation. The year ended with an annual inflation rate of 114.51% (One hundred and fourteen). At the same time, the Shining Path, a radical Maoist movement was challenging the government forces with ambush tactics and terrorizing the civilian population as a means of gaining power. Their actions, which had been restricted to the distant Andean regions started to pound the larger cities. 1988 was the end of the dream. The monthly inflation rate was over 12% and people were starting to feel the pain. Many people, especially government officials, had their salaries adjusted to inflation, but many people did not. In September, the government attempted to solve the issues announcing a package of economic measures. Many of these included getting rid of certain government subsidies, however, without tackling the fiscal deficit and the printing of new money. The result of the measures was that September had a monthly inflation rate of 114.12% and left a residual monthly inflation rate for the rest of the months of the year of around 40%. As a consequence of the economic problems 1988’s GDP dropped 9.4% placing us in the territory of an economic depression. The total inflation rate for 1988, was 1722%, completing the picture of stagflation. On top of everything, the Shining Path was gaining strength, causing massive blackouts in Lima, the capital city, and destroying the infrastructure of the country. Bridges, railroads, police stations, city halls, tunnels, etc, were blown up by explosives. 1989 was a year that seemed no government was taking care of the issues. The inflation rate remained at a monthly rate of 40%. People bought their groceries as soon as they got their paychecks and housewives got used to “cook for a whole week”. Businesses closed, restaurants and shopping centers were empty, and a curfew was in place which did not let people in the capital city wander in the streets after 10 pm. More than 80% of the country was under de facto military rule due to the suspension of the constitutional rights that came with the “state of emergency” caused by the Shining Path. The GDP fell for a second consecutive year at a rate of 13.4%. The overall inflation rate reached 2774.98% in 1989. 1990 brought some hope. It was election year. A new government was supposed to change the state of chaos that had engulfed Peru. Mario Vargas-Llosa, the famous writer, was leading in the polls as the leader of a right-wing coalition. He spoke clearly about the need of change and about the harsh measures needed to correct the economic and political environment. Alberto Fujimori appeared in the scene around March, out of nowhere. His campaign appealed to the people because the economic plan to solve the issues did not seem as hard as Vargas-Llosa’s. Eventually, Fujimori defeated Vargas Llosa. Due to the anxiety and speculation caused by the coming new government, inflation rate picked up steam and reached the level of 63.23% by July. By then, the inflation rate was being measured in a daily basis. It was common to watch the news at night and get the report of a 2% or 3% inflation rate for a given day. When Fujimori was sworn in as president, chaos caused by speculation soared in anticipation of the new package of economic measures. Gasoline was scarce, long lines in gas stations were common. Finally, 11 days after Fujimori took power, the Economy Minister delivered the economic measures. So harsh were the measures that he ended his address to the nation with the phrase: “God help us all”. The day after, the naturally chaotic streets of Lima were desolate. Soldiers were patrolling them. Violence was not absent. Supermarkets were sacked by desperate people; the highways were blocked by peasants. The fact was that the price of the most basic items went up by a factor of 5. Gasoline was up 33 times higher than the previous day. The whole country was paralyzed. August ended with a inflation rate of 396.98%. The year was the third in a row showing a negative growth in GDP, 5.1% and the inflation rate for the year was 7649.65%. The Shining Path did not stop its attacks; in fact they claimed to have achieved a strategic equilibrium in their battles with the army in the Andean regions. 1991 saw inflation slowing down due to the collapse in the buying capacity of the people, mainly because salaries were not adjusted anymore to it. However, as if being pounded by a depression, hyperinflation, a Maoist terrorist group were not enough, a cholera epidemic ravaged the country. Vibrio cholerae thrived in the collapsed water and sewer systems. 322,000 people suffered from it during 1991. Amazingly, the death rate was less than 1% due to the many years of people’s preparation (through TV ads and government programs) to treat acute gastroenteritis at home, especially in children. The Shining Path continued its offensive, showing for the first time deadly car-bombs in Lima, the capital city. 1991 ended with an inflation rate of 139%, taking into account that the monthly inflation rate by the end of the year was close to 3%. The GDP grew 2.1% that year meaning that the country could have been emerging from the depression. Between the end of 1987 and the end of 1992, the Peruvian GDP dropped 24.6 %, the inflation rate was over 2 million percent. The buying capacity of the average Peruvian dropped by more than 50%. Unemployment an underemployment were the rule. The Shining Path was finally controlled after the capture of its leader in September 1992. During those years, people got used to a lifestyle characterized by uncertainness. Finances, health, and life were not taken for granted and people learned to live like that. Above all, Peruvians did not lose their sense of family, their sense of friendship and their sense of humor, which anyone who knows Peruvians well would be able to describe. Energy is the basis of everything. From energy we obtain wealth. It takes energy to make everything we see around. The more energy is invested into the creation of something, the more costly that something would be. 82% of our sources of energy are non-renewable and 18% are renewable5. As a consequence of this, wealth creation is limited. Even in an utopian 100% renewable energy world, the rate of energy conversion to wealth will always have to be less that the rate of energy availability. In a world with finite energy resources, the creation of wealth can occur at different rates. Wealth can be distributed amongst the world’s inhabitants in an egalitarian fashion or in a non-egalitarian one. Capitalism creates wealth at a fast speed due to the natural human greed. In addition, it allows and promotes accumulations of wealth in a non-egalitarian manner. Individuals and corporations compete for wealth and obtain it from less effective individuals or corporations. So as the energy base is expanding, the system can be sustained in a more or less stable way if the masses are kept “happy” with the minimum necessary for happiness. This has been termed the trickle-down effect. Socialism creates wealth from energy at a slower speed due to lack of incentive for individuals and corporations. Socialism does not allow unequal distributions of wealth within a population. In a world of an expanding energy base, the slow creation of wealth might generate impatient masses as they see other societies generating wealth in a faster manner. Socialist societies do not look rich in a world of growing energy availability. If energy sources start to decrease, the creation of wealth will decrease. It would still have to be distributed between the current and future human beings. In a capitalist society, the competition for the dwindling wealth would be fierce. Individuals and corporations will become more ruthless to the point of denying the masses of their acquired right to the minimum necessary happiness. Masses would revolt, the society would become unstable. In a socialist society, everyone can have a share of the decreased wealth. Since wealth was not created at a fast speed, the decrease would not come at a fast speed either. Society would have time to adjust and take the necessary measures to increase efficiency and to survive. All the prior paragraphs assume a constant or increasing total population, however, either system will have a better chance of surviving if population actually decreases. In a capitalist world, population decrease might be a consequence of social instability. War, famine, and disease could the means by which population decreases. A socialist, tightly regulated world might be able to plan population-stabilization-and-decrease policies that might lead us to a “soft landing” when we finally reach the point in which the Earth’s human population carrying capacity is achieved, together with a rational use of renewable and non-renewable energy sources. World Total Liquid Fuel Production -January 2008: 87.18 millions of barrels per day (mbpd)1. The production is again the highest prodution recorded so far. However, the production of crude and condensate achieved its peak in May 2005. This means that the production of natural gas plant liquids (NGPL), ethanol, biomass to liquids (BTL), coal to liquids (CTL), gas to liquids (GTL) and processing gains is still increasing. According to certain estimates, the peak fossil fuel production will be reached in 2018, taking into account also coal and natural gas 2. In the meantime, the supply and demand mismatch will create oil price increases and a slowing of the world economies as an average. World Total Liquids Production -November 2007: 86.55 millions of barrels per day (mbpd). This is again the largest production recorded. However, the figure is very close to the ones on October 2007 and July 2006 so technically the global production is still at a plateau. The supply/demand relationship is still worrisome for 2008, which leads me to think that the barrel price will be more expensive than the average for 2007. If the world economy goes into a recession in 2008, the demand side of the equation would ease up the tendencies of price-climbing. The Cyclic Nature of Nature. Dying and Rebirth, Essentials for Invincibility. The quest to understand the nature’s phenomena started the moment in which the first spark of conscience was lit in the evolving animal brain. This spark eventually led to the fire that illuminated the minds of the ones who have changed how we see the world. This spark was generated probably some millions years ago and, I am sure, did not lit a fire instantaneously. In millions of years, the fire grew in slow motion. Slow motion for us, of course, since we have such ephemeral lives. The light provided by the growing fire was sufficient for humans to realize that things come and go. The day, the night, the moon, the stars, the greenness of the trees, the whiteness of the snow, they all make a come back after leaving us for a while. Some cyclic phenomena are more subtle and require more illumination. One of those is the cycle of daylight duration throughout the year. It took millions of years for the animal brains to figure out that there will be a shortest and a longest day, and a shortest and longest night. The durations of day and night changed slowly day after day. By trial and error and by the use of shadows and brighter light, the longest day and night were pinpointed and served as anchors for the development of calendars. The Sun, the bearer of light, the bearer of heat and other electromagnetic waves for this planet, is also the bearer of life. If something gives us life it is logical to consider that something with some respect, just like a progenitor. Unlike us, progenitors and progeny at the same time, the Sun comes and goes, not only in 24 hour cycles but in longer cycles. After the longest night of the year, when it seems that the Sun will eventually fade away, it returns stronger and stronger, showing that impending death was momentarily. Soon, the empowered Sun is able to bring back the green, the bird and the food. Invincibility, the ability to never be conquered, the capacity to make a come back when hope is fading, is a quality that our Sun posesses. 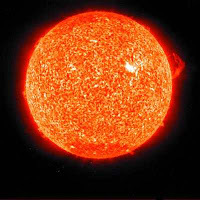 Even now, when our minds have been lit up so much that we know that in a couple billion years, hydrogen for the nuclear fusion reactions that power our Sun will deplete and reach a terminal decline, for our minuscule duration and importance, our Sun is invincible. World Total Liquids Production -October 2007: 86.43 millions of barrels per day (mbpd). This is the record production so far. The only way we can say we are not at peak is if we see a continuous production increase in the following months and years. It is important to realize that the most important issue is the supply and demand relationship. If demands keeps rising faster than supply it would not matter if we are at peak or not, the prices of oil will continue to rise. The other issue that I want to bring to the attention of my readers is that the crude and condensate (C&C) production peak occured in May 2005 and there are no signs that the record will be broken. So, what is the difference between C&C and total liquids? Total liquids include the following: Natural gas plant liquids (NGPL), ethanol, biomass to liquids (BTL), coal to liquids (CTL), gas to liquids (GTL) and processing gains. The increase in the non C&C liquid production has avoided a total peak so far. Still the relationship between supply and demand does not look good for the 4th quarter of 2007 and the 1st quarter of 2008. The record production of all liquids was in July of 2006 as I always repeat in these updates. If we only take into account crude and condensate (C&C), the peak production month was May of 2005. When I wrote my last update, we were in the third quarter, when all liquids demand started to surpass all liquids supply. Now, we are entering the fourth quarter during which the gap between supply and demand is going to get worse. The demand is going to be around 87.6 mbpd (million of barrels per day). This, together with the well known geopolitical concerns (Iran, Turkey, Pakistan, etc) will make the price of oil and its derivatives highly unstable for the next months. Are we seeing a pattern here? The month with highest production for all liquids is still July of 2007. As I said in my previous post regarding the oil production, the demand for oil will be significantly higher than the supply, and according to the IEA, the trend will continue in 2008. This will likely reflect in increased oil prices in the following months, taking into account the well known seasonal variations. Oil Production: May 2007: 84.94 millions of barrels per day. There is a dip in the production of oil. The IEA report states that Nigerian decrease in supply is partially to blame. What is more alarming is that, in the third and fourth quarters of this year, demand is going to surpass supply without any major political event going on (as it happened in 1973 and 1979). July of 2006 continues to be the month with most oil production recorded. The purpose of this course is to enable future aristocrats take active part in the destruction of the middle class. Middle classes, when they represent a significant percentage of the total population, create a pervasive environment that leads to common people acquiring positions of power that do not let hard working and smart individuals (and their offspring) achieve the power they deserve. The course is directed to the young sons and daughters of the nascent aristocracy, who need to completely dismantle the decaying but still powerful middle class. It is an organized form of knowledge that will help in the building of the ideological backbone of the future aristocracy. The syllabus of the course contains the following topics, which will be briefly described. 1. Democracy: The antithesis of Aristocracy. The etymology of the words democracy and aristocracy is as follows. Demos is a Greek work for people. Kratia is the Greek word for government. As a summary, democracy is the government of the people. Aristos is a Greek work that means best. As a summary, aristocracy is the government of the best. Future aristocrats have to be completely convinced that they deserve to rule because they are the best of humankind. Why are they the best? Because they have inherited the power from a prior generation that was already the best and were educated to be the best. In addition, the common people usually are not well educated and lack the character for optimal decision-making. This is why aristocracy and democracy are opposites. The common cannot be the best. Corporations have to first make sure that they can have the same rights that people in a democracy. Once that is achieved, they have to grow accumulating always a greater proportion of the generated wealth than the common people. The future aristocrats will be always at the top of a corporation. A historical analogy can be made with the feudal system of the later Middle Ages. The lord of the manor (CEO) will provide protection to the peasants (workers) in exchange for loyalty. Achieving this, starting with a society with a large and strong middle class, with a two century old tradition of democracy should take a few generations, however, the goals have to be set up. 3. Destruction of democracy… using democracy! As it was said before, the people lack optimal decision-making capacity. They will elect to office politicians based on charisma. They lack an intellectual framework that will be able to protect themselves and their offspring. The goal of this topic is to learn the tools that will enable the leaders who will destroy the middle class be elected. The process, once started cannot stop so if there is the risk of a setback in anyone of the electoral processes, mechanisms of fraud should be designed to avoid them, raising minimal suspicion. People tend to vote for candidates who show strength, who share beliefs in the supernatural with them and who are against “alternative lifestyles”. Fear, religion, ethnocentrism and homophobia should be exacerbated in electoral campaigns. It has to be taken into account that middle class people will be voting for their own destruction so electoral processes should always be taken seriously. Once in power, measures that transport wealth from the common people to the best people should be implemented. Tax-cuts for the wealthy are essential. The unions have to be dismantled. Common people (95th percentile or less) should be more concerned about paying energy bills, medical bills and food than to save for a decent retirement. Once this is achieved things should go smoother since the energies of the common people will be concentrated in survival. Once this happens they will look for the new aristocracy for protection. The educational system has to be reformed in a way that public education creates weaker children with useless knowledge. Fun has to be more important than intellect. In this way, superstition and fear will be able to be used more easily. Questioning should be discouraged. Socialism should become taboo. Established scientific theories should be placed at the same level with religious myths. A well educated middle class is the worst enemy of an aristocracy. The lessons from the French Revolution should not be forgotten. In other words, the Enlightenment should never happen again. The world of the future is a world in which energy will be scarce and wealth will be unevenly distributed. It is the right of the people with the best capabilities to rule and to guide the surviving common people to better grounds for survival of humanity. 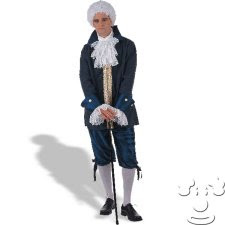 By the end of the course the future young aristocrat will know how and why a middle class should be dismantled in order to establish a solid and stable aristocracy that will replace democracy as we know it. Note from the author: For first visitors, I encourage to read the rest of my blog to get a feel of my real ideological positions. This post is intended to describe what kind of future is reserved if we let our precious middle class disappear. According to this, and looking at the figures of my previous entry, the production of oil seems to have reached a plateau since April of 2006. I think that it is still premature to call it a "peak oil", however, we have to keep an eye on it. Many people believe that oil production will soon achieve its peak. Some people believe that global oil production has already peaked. Regardless of individual opinions regarding the subject, if oil production starts to decline and it is not replaced by other energy sources at a greater rate than that of its loss, the global economy will enter a period of recession. The length and severity of the recession will depend, again, on the finding of new oil or the replacement of the oil loss by alternative energy sources. The intention of this series is to provide an easy access to internet surfers to the latest reports on global oil production. 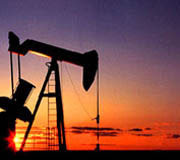 I am obtaining the data from Oil Market Report, published by the International Energy Agency. The production figures are expressed in million of barrels per day. According to this data, oil production seems to have peaked in July of 2006. However, as peak oil "experts" say, we would be able to identify the peak oil production some time after it had actually occured. There are many variables, like the finding of new oil fields, the production of oil from sources like tar sands and the arbitrary OPEC production quotas. I will try to update this information in a monthly basis. Specified complexity states that information that is “specified” can just be characterized as just a single informational unit. The example that is given is the one of the single letter of the alphabet. It could also be a bit or a pixel. A phrase, a novel or an article could also be regarded as units. By complex I understand “a group of single informational units”. A sequence of random letters would be complex, but not specific. 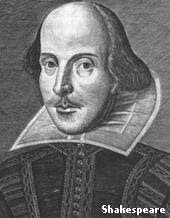 A Shakespearean sonnet would be specified and complex, because it can be regarded as a unit on its own and it is composed of smaller units (letters of the alphabet). When something is specified and complex, ID says, it has to be designed by intelligence. The creator of the concept even defines specified complex information as anything with a less than 1 in 10150 chance of occurring by (natural) chance. So, the Shakespearean sonnet, by being specified and complex, would have a less than a 1 in 10150 chance to occur in nature without the intervention of a designer. ID states that the DNA base sequences of living beings are specified and complex. According to it, they have a less than 1 in 10 to the power of 150 chance of being a consequence of random mutations aided by natural selection. ID implies that 4.6 billion years of molecular history is not enough to produce the genetic code of a bacteria or a human being. First of all, this theory is not taking into account the actual nature of DNA. DNA is made by protein-coding exons and non protein coding introns. The introns, are located in between exons, interrupting coding sequences. Since their genetic code is not transformed into protein, mutations that locate in them are not subject to natural selection so they remain part of the DNA of any given species. This has given rise to a genetic tool called the molecular clock, which attempts to establish the temporal relationship between different species and their hypothetical common ancestor. This makes the DNA look more like puerile writing, corrected by a teacher than a Shakespearean sonnet. Secondly, the creator of this theory has chosen the power of 150 to define when we are in front of creation by intelligence. He probably did some math, taking into account the mutation rates and the proofreading mechanisms; however, the theory cannot be tested by experiment, cannot generate any predictions, and cannot propose new hypotheses of their own. My third argument against specified complexity is logical. If we take the statement: “Complex specified information does not occur without the aid of a designer, or the chances of it occurring without that aid are less than 1 in 10 to the power of 150”. The statement seems correct, so now we have to determine if it is a validity or a tautology. The definition of complex specified information involves what is mentioned in the second sub-statement. It is the same as saying that “oranges are not cubes, or they are spherical”, i.e., a tautology. As a conclusion, I must say that it is clear that specified complexity cannot be counted as an argument against evolution by natural selection or for the existence of a designer. It fails the biological and the logical sense. In addition, it cannot be tested, like all other scientific theories, by the scientific method. I consider myself an atheist due to my lack of belief in gods, a bright (noun) due to my naturalistic approach to life, a socialist because I believe in redistribution of wealth so that society can avoid phenomena such as billionaires or homeless individuals. Philosophically, I must say that I am an epicurean. After reading for some time what Epicurus meant about life and how to live it, I can say that my goal is to live as close as he said life should be lived. I am going to show the 40 Principle Doctrines in different posts. After each Principle I am going to write a brief paragraph of what I understand of them. 1) A blessed and imperishable being neither has trouble itself nor does it cause trouble for anyone else; therefore, it does not experience feelings of anger or indebtedness, for such feelings signify weakness. Weakness means a vulnerable state. We are vulnerable when we are angry; we are vulnerable in extreme joy; we are vulnerable in sadness. Why? We become vulnerable because extreme emotion makes us lose awareness of our surroundings. On the other hand, strength is the ability to keep our integrity despite the intensity of the aggression. By living a moderate life avoiding causing trouble for us and for the people we interact with, we avoid situations in which we could be the subject of the anger of the individual we interact with. In addition, we save energy for what is really important. 2) Death is nothing to us, because a body that has been dispersed into elements experiences no sensations, and the absence of sensation is nothing to us. This seems very logical. Why worry about death? Dead people do not feel. This is one of the situations in which the concept of afterlife is pernicious. It creates an extra worry. Personally, my only worry would be the financial one, to assure my family with a secure future in the event of my death. The other issue with afterlife is selfishness. People who believe in an afterlife are still concerned about themselves even as they are going to pass away. On the contrary, it is better to think about leaving a legacy and to assume that our memories are going to be our only survivors. 3) Pleasure reaches its maximum limit at the removal of all sources of pain. When such pleasure is present, for as long as it lasts, there is no cause of neither physical nor mental pain present – or of both together. In the absence of disease and violence, which cause physical pain, the only source of pain is mental. Anxiety is a major source of “mental pain.” This is why, in order to achieve the state of maximum enjoyment of life, we have to live anxiety-free. This is difficult, especially in the 21stcentury world. The lesson here would be to remove minor daily problems as a source of anxiety and only worry about the important things of life. Of course, there will still be many major sources of anxiety for the common people, however, without the extra weight of the anxiety caused by the minor issues, the stress produced by the major ones would be better dealt with. 4) Continuous physical pain does not last long. Instead, extreme pain lasts only a very short time, and even less-extreme pain does not last for many days at once. Even protracted diseases allow periods of physical comfort that exceed feelings of pain. This is a good observation. After a major injury, the human mind loses its consciousness and when it is regained the memories of the injury are found to be erased. When this does not happen, post traumatic stress disorder is the consequence. I see this Principle Doctrine as an optimistic message for the future sufferer. I just finished this book. I think it is well written, easy to follow. I perceived at some times the attempt to mimic Gibbon’s style, however, I believe that author wanted to keep it simpler than that. The book gives the idea of an Ottoman Empire constantly in decline from the seventeenth century onwards, which is probably true. It places the pinnacle of the Ottomans at the siege of Vienna in 1683. It shows the multiple attempts and failures of ”westernization” within the Empire and the challenges the Empire had to govern the outer provinces. This is not said, but one can obtain as a conclusion that the Industrial Revolution and the Enlightenment reversed the balance of power that existed between Europe and the Ottomans between 1453 and 1683. Speciation is the formation of a new species. Defined more properly would be: “the evolutionary process by which new biological species arise.” It is a concept key to the understanding of evolution. Unfortunately, we live in times in which there is a great rift between scientists and not-scientists. Concepts that are basic for the science student at the university level are completely unknown for other people. The first step to understand the concept is to define what a species is. A good general definition of species is “the basic unit of biodiversity”. However, we need to get a little bit more specific. A working definition for the post, at least for the sexually-reproducing species, is “a set of actually or potentially interbreeding populations, which always generate fertile offspring.” Using this last definition makes us easily visualize that, for example, the dog, in spite of all its different morphologies is a species. A Fox Terrier, can breed with a Great Dane and have fertile offspring. On the other hand, a horse and a donkey can breed, but their offspring is not fertile. One creationist myth is that we have not seen a new species being generated since humans populated the planet. This is not true. Species have been created artificially. For example, domestic sheep were created by hybridization, and no longer produce viable offspring with Ovis orientalis, one species from which they are descended. The best-documented creations of new species in the laboratory were performed in the late 1980s. Scientists bred fruit flies, using a maze with three different choices such as light/dark and wet/dry. 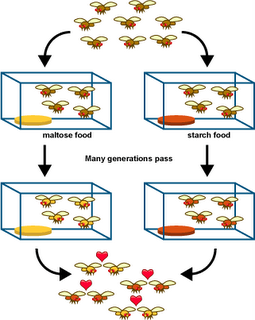 Each generation was placed into the maze, and the groups of flies which came out of two of the eight exits were set apart to breed with each other in their respective groups. After thirty-five generations, the two groups and their offspring would not interbreed. Evolution can happen in front of our eyes. The second step to understand the concept is to understand the mechanisms by which this happens. I am not going to go deep into this, however, I will explain the simplest theory which is the allopatric speciation.. During allopatric speciation, a population splits into two geographically isolated allopatric populations (due to geographical change or emigration). The isolated populations then go through genotypic and/or phenotypic divergence, through mutations, as they become subjected to different selective pressures. When the populations come back into contact, they have evolved such that they are reproductively isolated and are no longer capable of interbreeding. This is what happened in the experiment mentioned in the previous paragraph. Creationism implies that the species we see are the species that were created 6000 years ago by a divine being. This can be seen in websites such as Answer in Genesis. Intelligent design, a refined form of creationism, argues that a superior intelligence engineered the morphology of the current species and not different selective pressures through to random mutations in the genetic code. Unfortunately for the ID supporters, that would not be able to be proven since someone superior would have to have designed the designer, then the designer of the designer and so on until we reach the level of the supernatural designer, not provable, since it is outside nature. On the other hand, proper scientists have shown that new species can be formed and that the key for this is differential selective pressure combined with geographical isolation for a given period of time, which can be short like in the example of the fruit fly or longer like in the example of domestic sheep.